The "Master of Suspense" Alfred Hitchcock brought a best-selling spy novel to the screen with riveting results in this spellbinding espionage thriller. John Forsythe stars as an American CIA agent who hires a French operative named Devereaux (Frederick Stafford) to go to Cuba and check out rumors of Russian missiles and a NATO spy called Topaz. In Havana Devereaux s investigation becomes dangerous leaving behind a wake of shaken governments murder betrayal and suicide. His mission complete Devereaux returns to France but as he moves in to expose the double agent the danger and the suspense builds to a heart-pounding conclusion in this lavish globe-trotting thriller. As Alfred Hitchcock’s career came to an end, the results became less and less pretty. 1964’s Marnie was only sporadically interesting, while 1966’s Torn Curtain was terribly dull. That left me with a feeling of trepidation as I went into 1969’s Topaz. Set in 1962, a prologue reveals to us that a Soviet intelligence official (Per-Axel Arosenius) defects to the US while on a family vacation in Denmark. American CIA agent Michael Nordstrom (John Forsythe) facilitates this escape and brings them to Washington. The French find out about this as well, and they assign agent Andre Devereaux (Frederick Stafford) to find out where the Soviet family currently resides. Through discussions with the defector, the Americans learn of a trade pact between the Soviets and Cuba that seems intended to land weapons on the island. Nordstrom needs to investigate further and he entreats Devereaux to act as an intermediary since the various Cuban contacts don’t care for Americans. We follow Devereaux’s exploits and how they tie into a mysterious operation known as “Topaz”. If nothing else, Topaz stands out in one way: at 142 minutes, it’s Hitchcock’s longest film. After the disappointments I found with the last few flicks, I fretted that this trivia factoid might be the only notable thing about Topaz. To my relief, it turns out to be a perfectly serviceable little spy thriller. “Perfectly serviceable” sounds like faint praise for a filmmaker of Hitchcock’s renown, but I probably sell it short with that description. In no way does it compare to the better works made by the legendary director, so I certainly can’t praise it too highly. However, it manages to create a fairly taut and intriguing tale, so that gives it a serious step up over its immediate predecessors. That said, Topaz tends to feel somewhat anonymous. Hitchcock gives us a good thriller but not one that ever impresses us to a great degree. We manage moderate involvement in the tale and want to see where it goes, but that doesn’t seem good enough to me based on Hitchcock’s track record. I recognize that the director was in a tough position by 1969. Any filmmaker with so many great works behind him would find it difficult to live up to his legend. If a flick doesn’t dazzle, it thus disappoints. And when compared to classics of earlier decades, Topaz does disappoint. That doesn’t make it a bad film, however, as I think it succeeds in a global sense. Even with its extended running time, we stay involved with it, and I think it creates decent entertainment. Again, that still doesn’t seem quite sufficient for something from Hitchcock, and the absence of any real style or flair is what makes it come across as somewhat generic. I’m glad Topaz doesn’t feel like self-parody, at least; Torn Curtain veered dangerously close to that. Topaz just doesn’t pack much originality or creativity. I feel like any competent director could’ve made it and it didn’t require someone with the talent of Hitchcock. I like the film but can’t manage much enthusiasm about it. Topaz appears in an aspect ratio of approximately 1.85:1 on this single-sided, double-layered DVD; the image has been enhanced for 16X9 televisions. The film came with a fairly ordinary transfer. For the most part, sharpness seemed good. Some mild to moderate softness occasionally interfered, but not with regularity. Though I didn’t think the movie often looked particularly crisp, it managed to provide acceptable delineation. No issues with jagged edges or moiré effects materialized, but I noticed light edge enhancement throughout the flick. Source flaws were a general distraction. Through the movie, I noticed examples of specks, marks, blotches, hairs, nicks and other minor debris. The film also tended to be grainier than average. None of these concerns overwhelmed, but the flick could use a good cleaning. Colors tended to be a bit bland. The grain caused some of that, as that element diluted the vivacity of the hues. At times the tones became reasonably lively, and they were never bad, but I thought they could’ve provided greater vivacity. Blacks looked dark and firm, and shadows showed good clarity. All of this resulted in a “C+” presentation. Nothing spectacular emerged from the monaural soundtrack of Topaz. While it seemed acceptable for its age, I thought the quality of the audio tended to be more dated than I’d expect. In particular, speech sounded metallic and stiff. The lines remained intelligible – except for those from Dany Robin, that is, as the combination of her accent and the lackluster recording quality made her dialogue tough to understand. Nonetheless, I thought most of the dialogue was fine. The rest of the track followed suit. Music was clear but too bright; the score never became shrill, but it lacked warmth. Effects sounded similarly clean but without much range or dimensionality. Though I never felt impressed by the track, I still thought it merited a “C”. With that, we head to the extras. Instead of the usual “making of” documentary, this one features Topaz: An Appreciation By Film Historian and Critic Leonard Maltin runs 29 minutes, 23 seconds. Maltin looks at Hitchcock’s status as a filmmaker in the 1960s as well as aspects of Topaz and a view of its place in the director’s canon. It’s unusual for one of these Hitchcock documentaries to stick with only one commentator, but Maltin more than holds up his part of the bargain. He gives us an insightful and dynamic look at the film that throws out a lot of information in its short running time. It’s too bad Maltin didn’t record a full commentary for the flick, as he proves quite interesting in his recap of Topaz. Add to that cool glimpses of audience rating cards and other archival materials and this becomes a fine program. Three Alternate Endings appear next. These include “The Duel” (4:05), “The Airport” (1:23) and “The Suicide” (0:58). Apparently “The Duel” was the finale originally intended for the flick until preview audiences hooted it down. 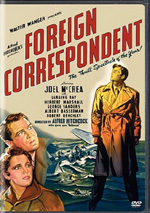 “The Airport” is the same conclusion found on this DVD’s version of the flick, but apparently “The Suicide” is the one that appeared during the film’s original theatrical rendition. None of them are great, to be honest, so I can’t pick one that I prefer. Next we find Storyboards for “The Mendozas”. This area uses still frames to show the storyboards as well as the relevant shots from the movie. I like the inclusion of the drawings, but I’d have preferred a split-screen running comparison to this still presentation. Some standard features complete the set. Hitchcock often made fun ads for his flicks, but the trailer for Topaz seems ordinary. In the Production Photographs area, we find 37 stills that cover publicity shots, ads and behind the scenes images. They’re moderately interesting but not great. Finally, text Production Notes offer a few modest basics about the flick. 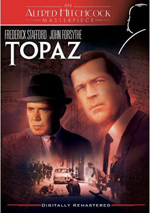 As Alfred Hitchcock’s career wound to an end, he manages a moderately interesting spy thriller via Topaz. Though the movie seems fairly generic for one of Hitch’s works, at least it creates a reasonably enjoyable tale. The DVD offers average picture and sound along with a pretty good collection of supplements. Topaz is average Hitchcock, but that’s enough to make it worth a look.